Christina Lee: In Honor of Le' Kiss (Le' Sigh)! In Honor of Le' Kiss (Le' Sigh)! So today I thought I'd celebrate the art of KISSING! But first, a reminder about Monday--the BIG day! 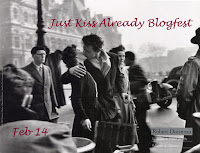 The Just Kiss Already Blogfest Stina and I hosting! We are starting at 7 am EST! There are fifty of us now! Click HERE for the easy peasy rules! Now back to the KISSING! The building tension, intense eye contact, the distance closing, and then BAM! Shiver me timbers. :D I love writing those scenes! So here are (some of) my favorite KISSES. It was hard to choose! And, in the book PERFECT CHEMISTRY, their first kiss in Alex's house from his POV! Yay!! I can't wait to see all the fabulous entries! Unfortunately I won't be one of them *blushes*! I signed up for another blogfest months before and just realized it as I looked at my sidebar last week. It's not a lack of love, just a lack of time and space. Don't hate me. I still love you both. OMG! My word verification was: haters (this friday isn't looking so good). Amazing kiss choices. I'm all over your blogfest on Monday. My team blogfest is going on today, so I decided to start my writing segment today and continue it for your blogfest. Kind of fun! Those look like some might fine kisses (and I haven't seen/read any of them!). How can I not have run across any of those? It's not fair. I've never seen atonement. It looks interesting though. I love ALL the kisses in Vampire Diaries. Seriously. Those writers know how to make something epic and those actors do the writing justice. You just revived my love for kissing. Pucker up hubs!! I wholeheartedly second the Atonement kiss. That dress is to die for, and the cinematography of that movie is breathtaking. A friend of mine was working on a kiss scene and I emailed her that first kiss from Alex's POV. Love that book! I usually watch Vampire Diaries, but I think I missed that episode! I'm gonna play along as well. best kiss ever - the notebook, where ally jumps into noah's arms and they kiss in the rain. swoon!